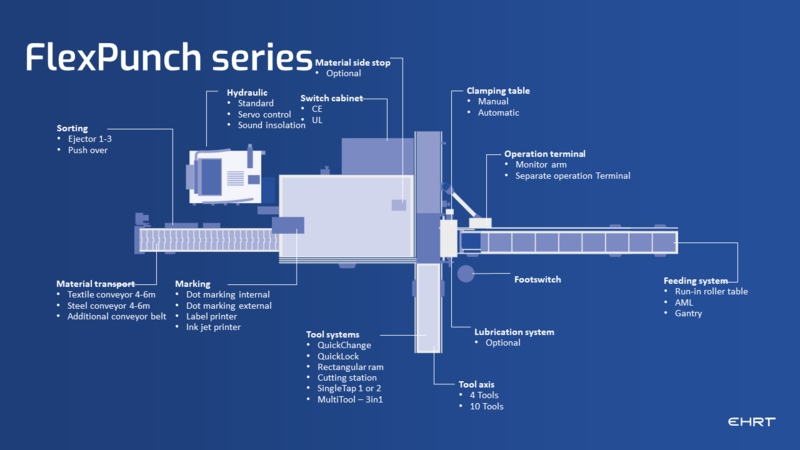 The Gantry System from EHRT is a big step towards machine automation. It is a storage system with a gantry crane, which enables the punching machine to work independently. Storing or relocating the bars is fully automated by the gantry system. It offers the operator the option of storing different materials at the same time. The punching machine is automatically loaded with the stored materials depending on the order. As with other EHRT software solutions, the stock quantities and status of the gantry can be checked both at the machine and from an office. This leads to a significant reduction in personnel costs at the machine. Like the stock status, current orders can be followed from an office as well as the machine. Orders to the gantry in relation to storing, relocating, retrieving materials and loading for production jobs can be executed simultaneously. The gantry can replace an existing material storage facility.